The Mitel 5302 IP Phone is designed for those who require an economical entry-level IP desktop device while taking advantage of the cost savings of a converged network infrastructure. The 5302 IP telephone and is designed for users requiring access to basic telephony and messaging services. Working behind the Mitel 3300 IP Communications Platform (ICP), this IP phone provides increased choice and flexibility for enterprise or small business users. While the 5302 IP phone is an ideal point of sale phone for the retail market, it has a broader appeal use in many environments. As a retail phone, it is optimised to address the small footprint often required at a point of sale/cash register area. It is an ideal classroom phone for both secondary school and higher education environments. Teachers are able to make and receive pages, access office staff with a single speed dial key, make and receive calls to the classroom, and the second port allows a PC to be attached in the classroom. 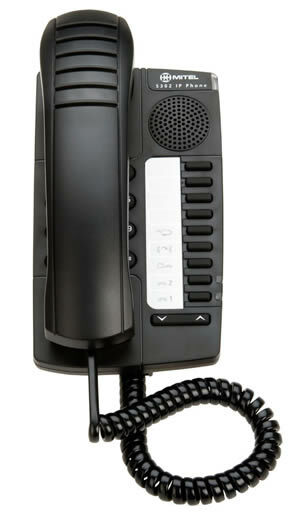 Healthcare, hospitality and general business markets can all benefit from this economical IP phone. 4 Programmable keys: speed dials, features access codes, paging, conferencing, voicemail access etc. Every Mitel 5302 IP phone from Telephone Magic comes with a full 1-year warranty.